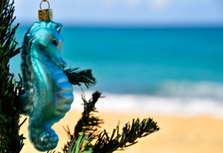 Christmas beach theme decorations range from simple and elegant to elaborate, breathtaking displays. Choose cool ocean colors, sandy textures, and shiny accents to create this elegant Christmas beach theme. Here you’ll find decorating tips for celebrating the holidays in seaside style, as well as a variety of beach theme decorations and ornaments for your home and Christmas tree. What type of garland works best for a beach theme Christmas tree? 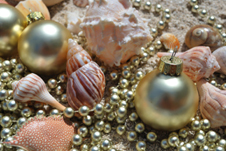 Shell garland or pearl garland makes a beautiful accent to beach theme ornaments. Drape your tree with ribbon in cool beach colors such as greens, blues, corrals, and yellows. Bead garland in gold, silver, or bright blue beads add sparkle and shine. The best Christmas lights for this tree are blue or white in color. Complete this Christmas tree theme with a starfish tree topper and accent the Christmas tree skirt with a nautical net.